In order to make the first slid amazing, we advise capturing a portrait with a monotonous background (a monotone wall, for instance). In this case, due to the lack of a background or foreground, your rotation angle (and therefore the depth effect) will be at a maximum. Don’t forget to wipe your device’s camera with a cloth before capturing. Place the desired object in front of a background and ensure that it’s well illuminated. Remember that during capturing, people can’t be moving around or blinking. Launch printable slid capturing mode. 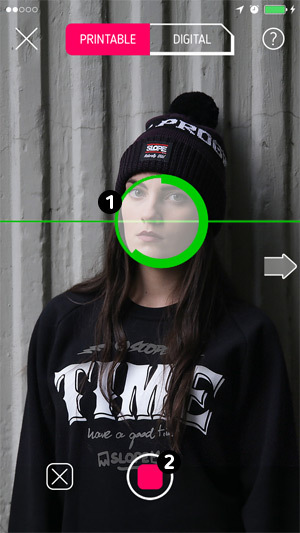 Choose the perspective (ideally, the circle in the center turns green) and move the circle1 in the center with your finger so that it is on top of the face. Start capturing by pressing on the button at the bottom of the screen2. Smoothly move the device in a single motion around the object being captured as was described here. When the circle1 is filled and the app goes to the next screen, you can lower the device. Check the result on the filter selection screen (you will not see the depth there, but you must check that the desired captured object is sharp). If you wish, trim the slid by using a two-finger gesture. Apply a color filter and follow the instructions on the screen to order the slid. Very soon you will receive your wonderful slid through the mail. In order to better understand what slids you will end up getting, check out our channel on YouTube or Instagram.